Drive Power Neb Ultra Compressor Nebulizer is perfect for patients who need nebulized medicine with a compact easy to use nebulizer. It is one of the smallest and lightest nebulizer weighing only 3.2 pounds, which makes it convenient to store and carry from room to room. How To Operate Power Neb Ultra Compressor? What is Power Neb Ultra Used For? People with breathing problems, such as Asthma, Cystic Fibrosis or Chronic Obstructive Pulmonary Disease (COPD) are often prescribed medicines that minimize or control the symptoms of their disease. Compressor Nebulizer Systems deliver these prescribed medications to the lungs. 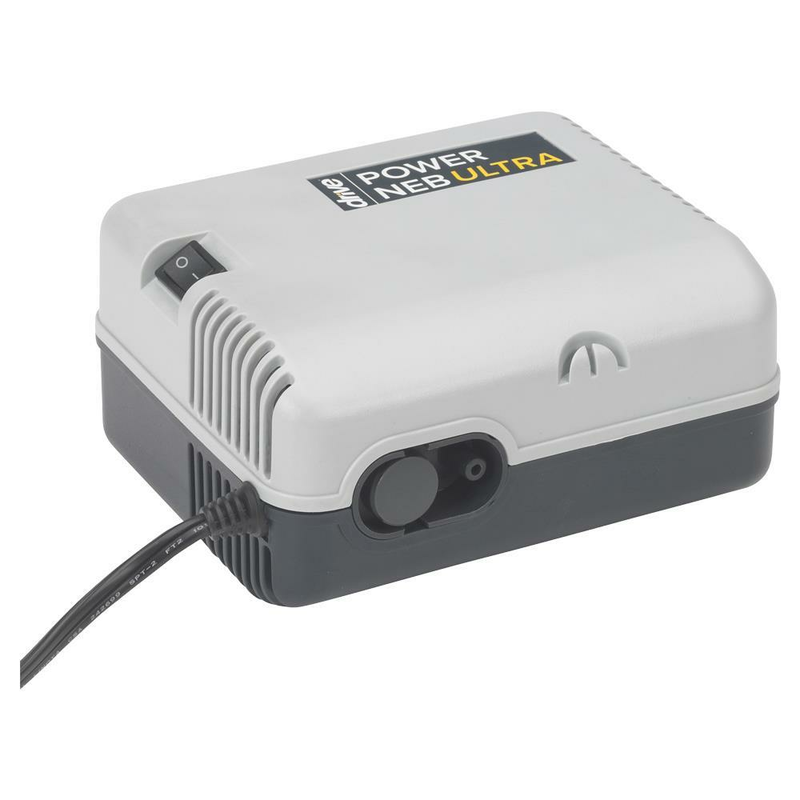 Drive Power Neb Ultra Compressor Nebulizer includes an AC powered air compressor to provide a source of compressed air for home health care use. 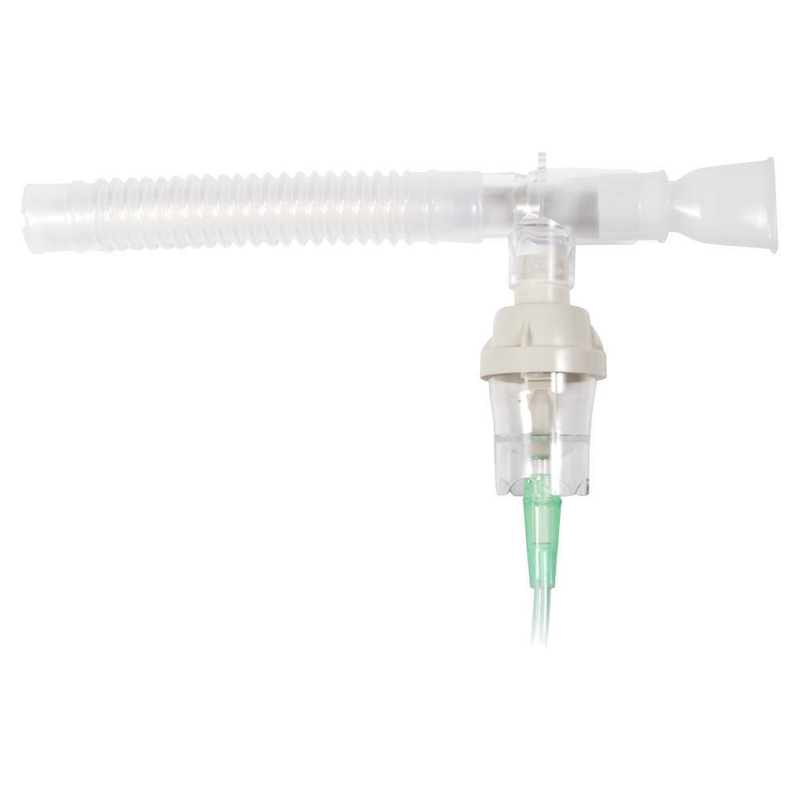 This compressor is used in conjunction with a jet (pneumatic) nebulizer to convert the inhalable drugs into an aerosol form for inhalation by a patient. 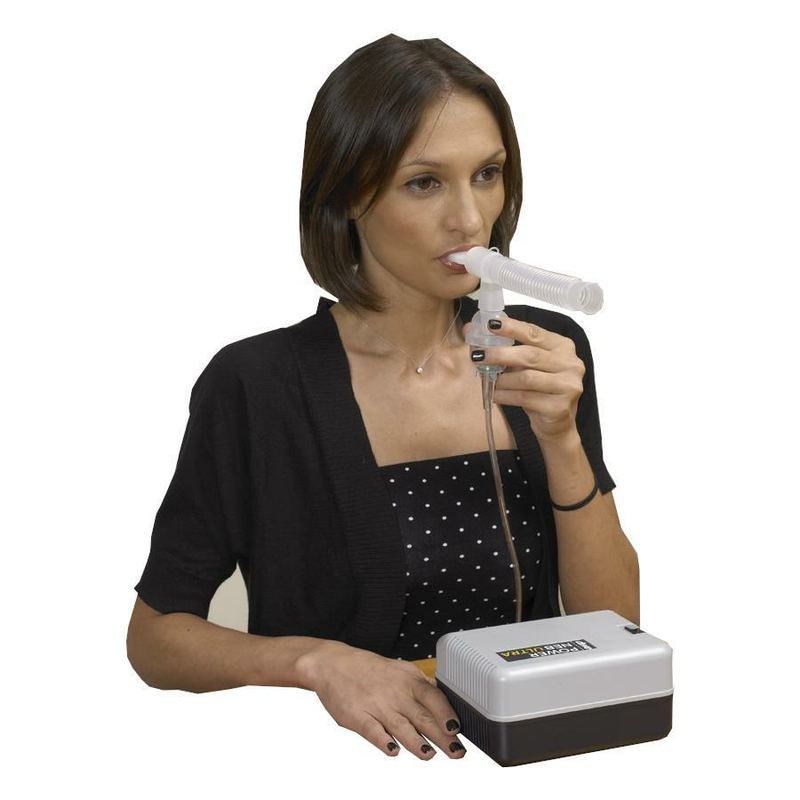 The medications and compressor nebulizer systems are used as directed by a physician to maximize the benefits. They can be prescribed for everyday use or periodically as symptoms present themselves. How Does a Compressor Nebulizer Work? Most medicines that are to be used with a Compressor Nebulizer System are created in a liquid form. This liquid medication is placed in the nebulizer cup. 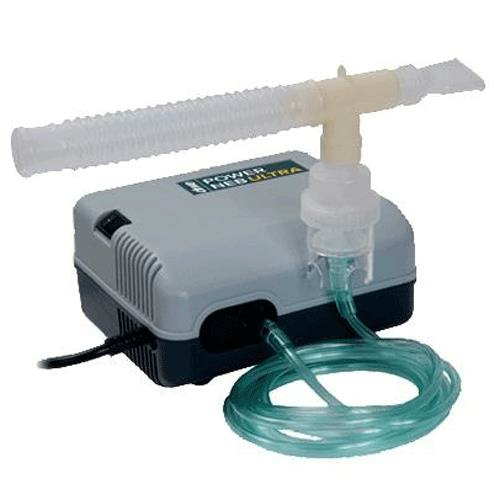 The compressor is connected to the nebulizer by flexible tubing and generates a specific pressure and flow of air that drives the nebulizer. The pressurized air produced by the compressor initiates the ability of nebulizer to break down the liquid medication into a very fine mist. This mist is often referred to as an aerosol cloud. It is propelled out of the nebulizer and inhaled into the lungs where the medicine is readily absorbed. Before each use, inspect the Compressor and nebulizer cup assembly for damage or wear, replace as needed. Place the Compressor on a table or other flat stable surface. Be sure you can easily reach the controls when seated. Do not use this device on the floor. With the power switch in the O (OFF) position, plug the power cord into an appropriate electrical wall outlet. Connect one end of the tubing to the compressor air outlet connector. Assemble the nebulizer cup and add indicated medication to the nebulizer cup before use. Attach the other end of the tubing into the air inlet connector found at the bottom of the nebulizer cup. Turn on the Compressor by pressing the power switch to the I (ON) position and begin treatment. If treatment needs to be interrupted, simply press the power switch to O (OFF) position. When the treatment is complete, turn off the compressor by pressing the power switch to O (OFF) position and unplug the unit from the electrical outlet. Always unplug this device immediately after use. Do not use this product in or near explosive atmospheres, or where aerosol (spray) products are being used. Do not pump combustible liquids or vapors with the product or use in or near an area where flammable or explosive liquids of vapors may exist. Do not operate this product in an oxygen enriched environment, i.e. oxygen tent or oxygen hood. All parts of the nebulizer, except tubing, should be cleaned according to the following instructions. With the power switch in the “ Off” position, unplug the power cord from wall outlet. Disconnect tubing from the air inlet connector and set aside. Disassemble mouthpiece or mask from the cap. 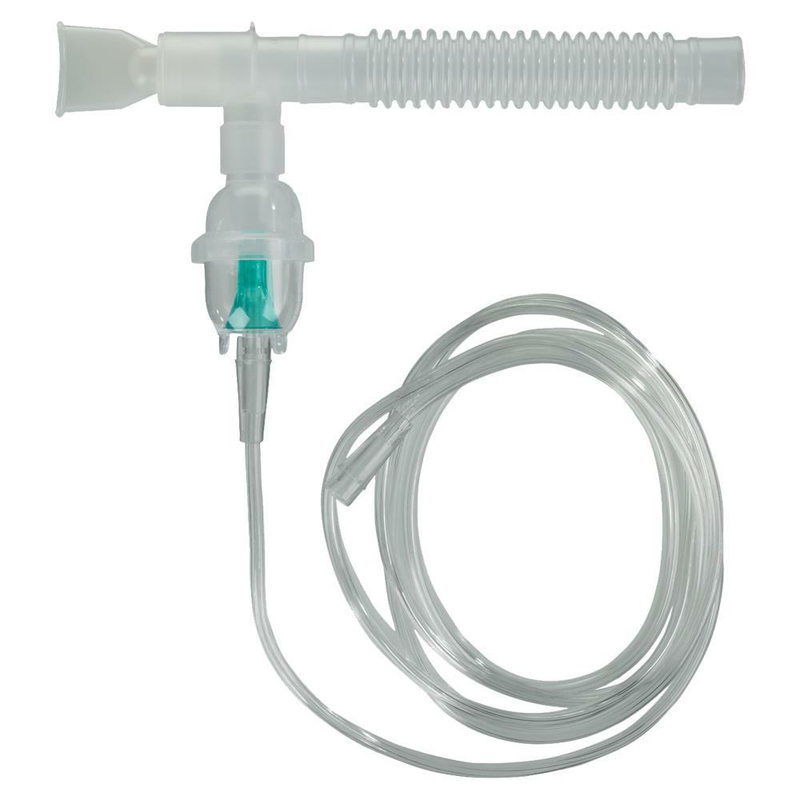 Open nebulizer by turning cap counterclockwise and remove the baffle. Wash all items, except tubing, in a hot water/dishwashing detergent solution. Rinse under hot tap water for 30 seconds to remove detergent residue. Allow to air dry. For reusable nebulizer only, it can be cleaned daily in the dishwasher using the top shelf or by following the above cleaning procedure. Drive Reusable Nebulizer is dishwasher safe, but do not place any Drive Disposable Nebulizer parts in an automatic dishwasher; doing so could cause damage. With power switch in the “Off ” position, unplug the power cord from wall outlet. Wipe outside of the compressor cabinet with a clean damp cloth every few days to keep dust-free. Do not submerge in water; doing so will result in compressor damage.